Sustainable fashion is increasingly becoming a topic of discussion. It is no secret that the fashion industry is one of the most fast-paced and polluting industries out there that has no excuse not to change its ways. When it became public knowledge that mega-brand Burberry destroyed £28 million worth of items, I couldn’t stop wondering how much water, material, CO2 and work was wasted. I was angry at the brand, but soon realised that as a self-proclaimed shopaholic I was to blame too. Since my early uni days I tried and tested the idea of a capsule wardrobe many times. To my own surprise I managed to keep my wardrobe pretty minimum, limited my shopping to once each season and even learned how to travel light! Obviously this concept soon went out of the window, but I am much more conscious when buying new items. In an attempt not to end up with a closet full of clothes but nothing to wear, and trying to save some money for… well anything really, I shop by two rules: 1. can I wear this with items I currently own already? and 2. is this item something I can combine in multiple ways? If the answer is yes, then I will consider buying. I normally tend to stay away from trendy items as experience shows I get fed up with them very quickly. Fendi, Gucci, Balenciaga, all sound like music to my ears and feel like heaven on my body but you know who doesn’t appreciate these brands? My bankaccount. I have been eying up Fendi bags that seem to start at a humble £900, Balenciaga trainers that cost a small fortune and let’s not discuss all things Gucci on my wish-list because we might spend all damn day! As a strong independent woman I refuse to let money come in between me and my handbags dreams. This is why I have no shame in telling you that TK Maxx is a place you should check regularly to get your hands on that luxury item you refuse to spend all your hard-earned money on. Apparently, certain areas have better stock as do certain areas have better vintage shops that tend to sell vintage-second-hand Chanel for a fraction of the retail price. But a strong independent woman is also too busy to spend her weekends browsing far-away shops in the hopes of finding the vintage handbags of her dreams. This is how I discovered my latest addiction, vintage online shopping. 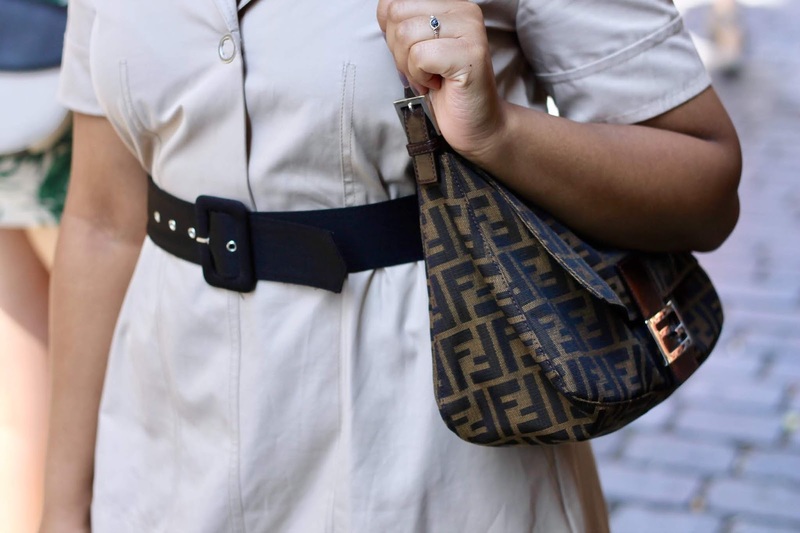 I first spent a bit too much on a vintage Fendi I got from Farfetch, but then discovered the godsend called Vestiare-Collective. Vestiare is definitely not the place to shop without doing research, but with a bit of persistence it is where you can find the best deals ever. I bought my vintage Dior here and although it was a bit of a (hilarious) disaster, the quality and authenticity of the bag is not questionable. If you follow me on Instagram, you will have seen my most successful Story of all time. I shared my reaction/disappointment/confusion when I received my Dior bag and received soooooo many DMs! What happened, and what is definitely my own stupid fault, is that the bag is so much smaller than I thought it would be. On the photographs the bag looked like a normal-sized small evening bag that would at least fit my phone in. However when the bag arrived I was quick to call it a wallet on a chain… My own fault, as I said, because the size of the bag was clearly indicated on the page I just didn’t bother to measure the numbers against my other bags. This disaster aside, I love that vintage bags are unique, that they are used and that they are so cheap! I couldn’t think of anything worse than spending thousands of pounds on something, only to see everyone and their dog wear the same thing. At least with vintage I know the chances of someone else having the same item are really small, plus no new resources have been wasted and I saved a lot of money while still treating myself to a luxury item. Win-win-win-situation if you ask me!